Erector metal construction sets were introduced by A.C. Gilbert in 1916. It was an early competitor to Meccano. In 1930 A.C. Gilbert bought over the American Meccano factory. Erector lasted until 1990s. 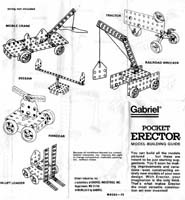 However from the late 1960s the Erector company was having serious problems and it went through a number of owners (Gabriel, Ideal Toys & Tyco Toys) until it closed in the late 1990s. 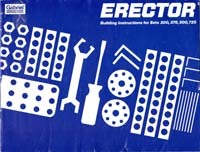 Meccano then bought over the Erector brand name in 2000 and now uses that name to sell Meccano in the American market. The 1929 instruction manual for Erector set 3. The 1938 instruction manual for Erector sets up to 4½. The 1954 instruction manual for Erector sets up to 10½. The instruction manual for Erector sets 200, 375, 500, 725. (Ideal Toys era).